Perfect for spicing up a simple ensemble, these comfortable men's socks are anything but garden variety. Bright avocado halves cascade across a pinata blue background in a hosiery homage to funky California style. Made in South Korea. Very cute! My boyfriend loved them! Great sick that is comfortable and doesn't wear easily. Would buy again! Just what my partner wanted! These are so great for my brother who works at an elementary school! 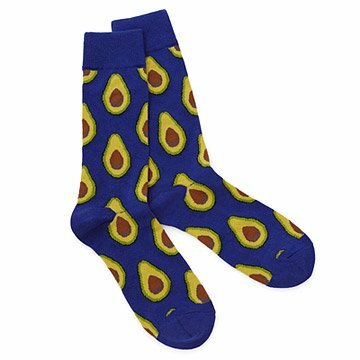 Make sure your ensemble is always in season with these charming avocado socks.